Happy Halloween everybody! I hope all of you have a frightfully wonderful holiday. And a happy one to you too Brian! "We’ve all heard the allegations. Halloween is a pagan rite dating back to some pre-Christian festival among the Celtic Druids that escaped Church suppression. Even today modern pagans and witches continue to celebrate this ancient festival. If you let your kids go trick-or-treating, they will be worshiping the devil and pagan gods. Nothing could be further from the truth. The origins of Halloween are, in fact, very Christian and rather American. Halloween falls on October 31 because of a pope, and its observances are the result of medieval Catholic piety." " Trick or treating and wearing costumes were first done by the Druids to keep themselves safe from evil spirits? Bobbing for Apples was done to obtain favor with the evil spirits. People would kneel around a tub of water filled with apples. The first person to get an apple without using their hands, would have good luck and favor from the spirits for the coming year." 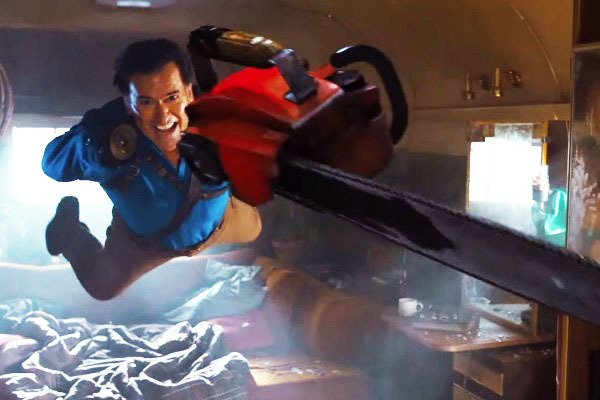 Ash vs Evil Dead starts tonight - can't wait!